Provost Jonathan Holloway speaking this month to incoming students, the first class to include 20 percent of students who are Pell Grant eligible. Holloway and President Morton Schapiro announced the update in a welcome email to students. Northwestern has reached its goal of admitting a class of 20 percent Pell Grant-eligible students, a step toward increasing access for underrepresented students. 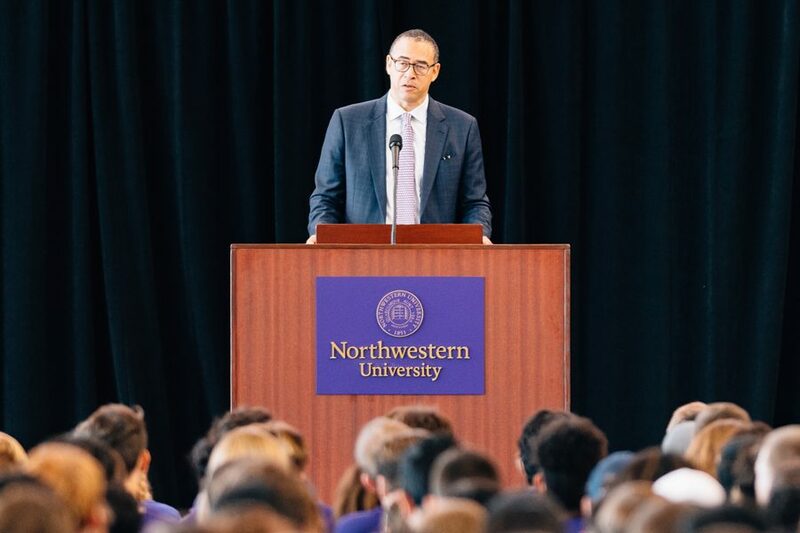 Amid notes on the University’s U.S. News & World Report ranking, deaths in the Northwestern community and increases in funding for Counseling and Psychological Services, President Morton Schapiro and Provost Jonathan Holloway said in a welcoming email to students that the undergraduate Class of 2022 is Northwestern’s most diverse class to date. Coming from 47 states, 54 countries and “every walk of life,” the email said the class of 1,936 is full of students with different backgrounds. More than 150 students graduated from Chicago Public Schools, 13 percent are first-generation college students, and, for the first time, a full 20 percent are Pell Grant-eligible. “This means that a significant number of our students come from low-income backgrounds that far too often have not provided pathways to premier colleges,” Schapiro and Holloway wrote. In 2016, Schapiro announced a school-wide priority to have 20 percent of an incoming class be eligible for the federal grant by the fall of 2020. According to Northwestern’s We Will campaign, 19 percent of the class of 2021 is eligible. The new statistic shows the University has now achieved the goal with the class of 2022 — two years ahead of schedule. Christopher Watson, dean of undergraduate admissions, said it was a tremendous effort across the entire University to reach the Pell Grant objective early. “Northwestern is a better place for becoming a leader in access, especially compared to our peer schools,” he said. Watson maintained Northwestern follows a need-blind admission policy, meaning students are considered without taking into account their ability to pay. Instead, among other factors, the process includes a review of what an applicant may share regarding home life and background, he said. The achievement also would not have been possible without a “steadfast commitment” to need-based financial aid, he added. While the University is working to reduce expenses to deal with a budget deficit — including cutting staff positions — Schapiro and Holloway wrote that investing in financial aid has been a critical commitment that has included doubling aid for undergraduate students. Madisen Hursey, co-president of Northwestern Quest Scholars said the 20 by 2020 milestone has fostered positive changes for the community of low-income and first generation students. The organization, which advocates for for students who identify as low-income, saw a huge showing of excited freshmen during their Wildcat Welcome programming, the Weinberg senior said. With support from high-ranking University officials, Hursey said, students feel more welcome and comfortable. Hursey said she is excited to see what the school will do to meet the needs of the growing community, she said.